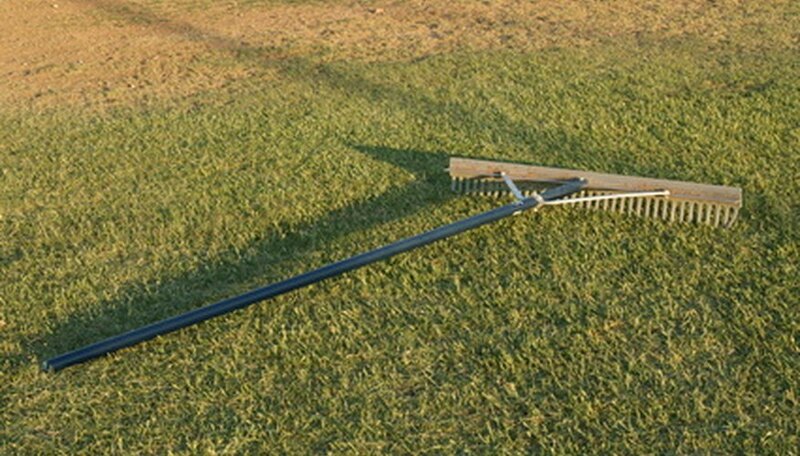 A landscape rake is a hard-tined metal rake that either can be a hand rake or can be attached to a garden tractor. Garden rakes can range from a few tines to wide rakes with closely spaced tines. Unlike a leaf rake, landscape rakes have very little give as you work them through the soil. Landscape rakes are sometimes called garden rakes. Landscape rakes are often used to break up clumps of soil that might interfere with seeding and planting. By repeatedly raking soil, large clumps break up into smaller clumps. If a landscaper wants very small clumps, or even no clumps, using progressively smaller landscape rakes can result in very fine soil surfaces. A landscape rake, especially if leveled and mounted behind a garden tractor, can help level soil. Soil leveling is important if planting a large expanse of grass, such as in a park or on an athletic field. Landscape rakes are useful for soil grading. For example, in some cases a pitcher’s mound in a ballpark is graded using a hand landscape rake. Grading is the process of creating an incline with soil. Wider landscape rakes can be useful when cleaning up after tree or shrub pruning. The hard tines can trap stiff branches and twigs and help to stack them for collection. A small landscape rake can help to remove weeds from between garden rows. Although a hoe is often the tool of choice for weeding, a small landscape rake can either remove larger weeds or help you to gather weeds cut with a hoe from between your garden rows. Livestock stalls often have straw as bedding. Once the straw becomes soiled, it needs to be removed. A landscape rake sometimes is a good tool for hooking the soiled straw and pulling it from the livestock stall. What Is the Difference Between a Cultipacker and a Cultimulcher?